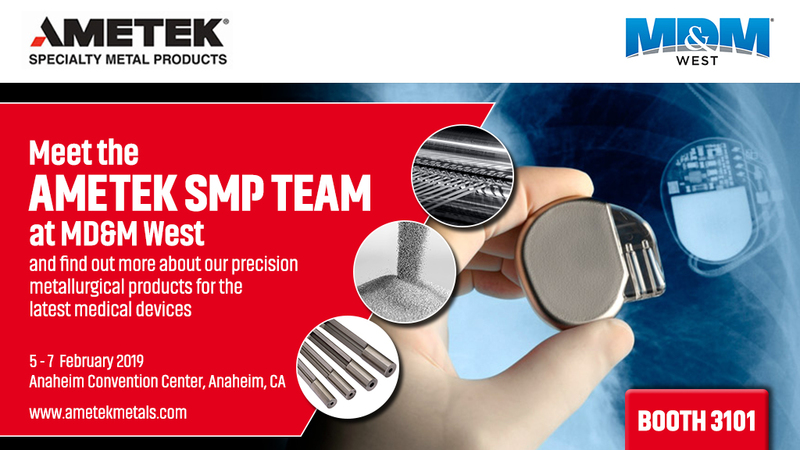 AMETEK Specialty Metal Products (SMP), a leading global manufacturer of advanced metallurgical products for critical medical applications, will be exhibiting at Medical Design & Manufacturing (MD&M) West from February 5th to 7th. North America's largest medical device technology trade show and conference, this event is being held at the Anaheim Convention Center in California. Hamilton Precision Metals specializes in producing precision titanium strip with fine grain size for drawability and superior surface finish used in implantable devices. The titanium strip and foil products can be reduced to ultra-thin gauges with low roughness or high roughness for electrode, cathode and antenna applications. In addition, Hamilton works with a wide range of other medical alloys, including stainless steels for surgical instruments and battery enclosures, resistance alloys for medical diagnostics, and MP35N® for stents and spring connectors. Specialists in high purity nickel strip for critical battery connectors, SMP Wallingford also produces specialty shaped wire for use in orthodontic brackets and toothbrush staples as well as channel wire for the superconductors used in MRI scanners. Using a proprietary production process, both Hamilton and SMP Wallingford are also now able to produce titanium strip in grades 9 and 23 to facilitate the external charging of implant device batteries. Reading Alloys will be demonstrating its high quality porous titanium coatings used in total joint replacement devices including artificial hips, knees, elbows and shoulders. Also on SMP’s stand will be Fine Tubes and Superior Tube who will be exhibiting their precision tubes for implantable heart valves, vascular stents, trauma and orthopedic implants, endoscopic surgical instruments and spinal cages. MP35N® is a registered trademark for SPS Technologies.